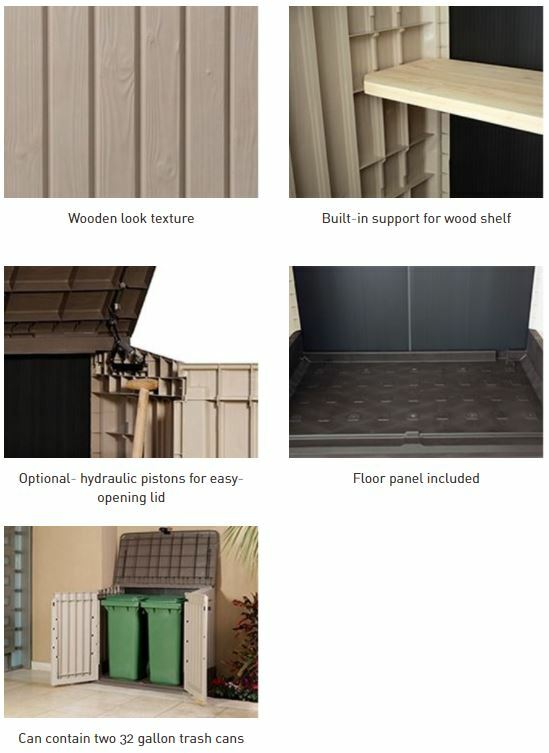 Keter’s Store-it-Out Midi regards a cheap plastic garden storage facility, affordability generates vast global sales, decay resistance delivers sustainability throughout the ever changing weather conditions without succumbing to damp & heat deterioration, it’s super-easy to clean, arrives flat-packed yet is a doddle to construct. Before we get rolling with the Midi it’s important to accept this is a low cost unit therefore robustness accompanied with top security is obviously not on the agenda here. It does have a slightly waver-able plastic structure however it delivers weatherproof credentials for outside storage accommodation, hence the Store-It-Out name. It’s surprising how many purchasers expect a Fort Knox construction reading through the 1-5 star reviews; not at this price. The Midi is probably the lowest priced unit out there, just compare the competitions prices, it all becomes apparent. We became disillusioned with the upkeep work demanded by our last wooden shed, their inability to stand up to damp conditions no matter how many re-coats of varnish we nurtured the wood with, they still become susceptible to decay setting in. Once the rot eroded the floor we escaped the hassles and opted for resin’s ease of maintenance. 3 facilities make-up the Store-It-Out range. This Midi represents the smallest cabinet style, the next size up regards the most popular Store-It-Out Max whilst the largest dimensions of the Store-It-Out Ultra are able to accommodate an abundance of gear. Store-It-Out’s low profile designs are unobtrusive on the eye, stand unnoticeable against a house wall, sit under the height of the average garden fence whilst the Midi is small enough to occupy a patio, balcony or backyard without being over showy yet surprisingly they’ve a fairly voluminous internal storage capacity. The Midi is not designed for any specific purpose, rather dependant on one’s ideas. Intentions are a low-cost way to help organise the garden more efficiently, hence their popularity. 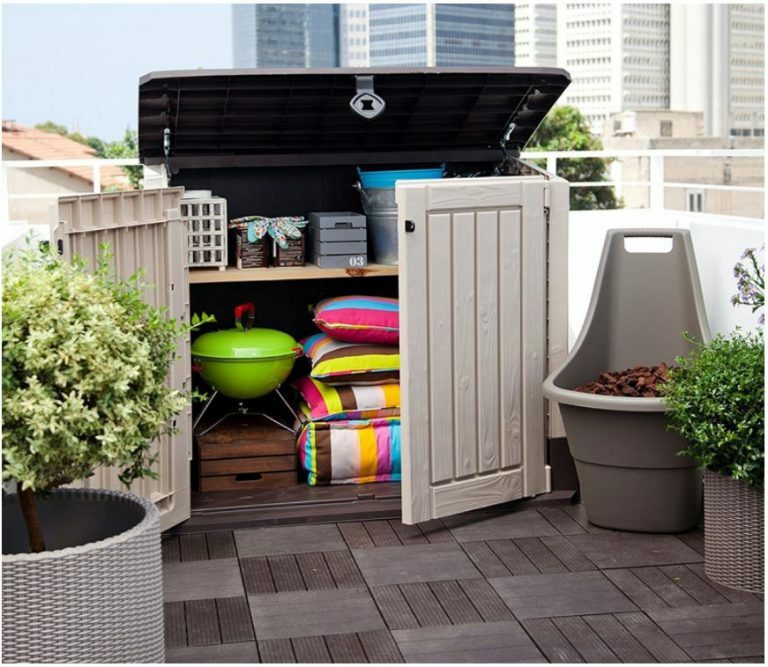 Favourable storage services include: Harbouring gardening tools, lawn feed & plant supplies, patio accessories, a dry log-store, a fab shelter for kids toys, sporting equipment, BBQ paraphernalia & grilling utensils, work tools, animal feed, the list runs on-and-on. What’s your idea? Environmentally friendly recyclable polypropylene resin constitutes the make-up of the Midi delivering a weatherproof design. It’s Cheap & Cheerful. The impervious composition goes through a UV stabilisation process to armour the make-up with protection to overcome plastic’s underlying issues associated with colour fade and cracking when left unsheltered from the onslaught of sunburn preventing bleaching, splitting, peeling and blistering. The colour pigments added result in either a beige/brown, grey/black or espresso brown shade dependant on the chosen model. The facade’s formation arrives in sheet form. 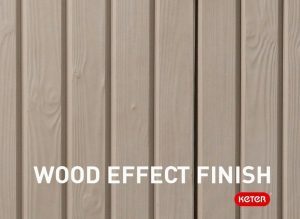 Internally a ribbed structure produces stability whereas on the outer-surface the manufacturing procedure moulds a semblance of vertical wood panelling incorporating textured grain resulting in an effective outer-appearance. Each resin panel interlocks with the floor and next sheet through a quick snap into place technique and secure with screws. Assembly’s fast, pleasing inexperienced DIYers. 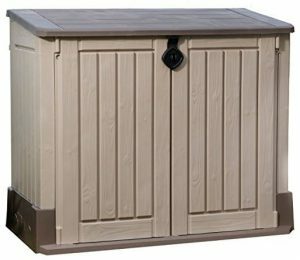 If you fully immersed Keter’s Store-it-Out cabinets they would leak through their interlinking gaps so they can’t be described as fully waterproof yet their composition is impervious to rainwater and the design is weatherproof for the elements falling down upon them, aiding to maintain a dry internal space, critical for storage preservation. Washing down with a soft brush, warm water and detergent shifts deep-seated grime however most just shower them down with a light hose whilst watering the plants, this is my job on a summer’s evening, completed in minutes. Polypropylene resin resists rot & decay and requires no future maintenance roles with regards to re-coats of varnish or paint, putting an end to yearly conservation issues. Designed with a slight angle, the Midi lid delivers efficient rainwater drainage whilst stretching out beyond the facade’s edges averts the occurrence of rainfall leaking in at the top of the walls. The lid is hinged which operates the opening however gas shock pistons inclusive on the larger Store-It-Out Max are an optional extra here, hence the Midi’s low price. Plastic hinges function the double doors entrance whilst the Midi is fit with a 3-way clasp designed for a padlock adjoining the lid and both doors together. The clasp shuts and locks the triple door access simultaneously. Padlock is not included. The floor panel comes in one sheet to where the facade sheets interlock. The floor delivers enclosure to the outside environment aiding to maintain a dry internal space preventing waves of leaves around Autumn time wafting through gaps at the base. 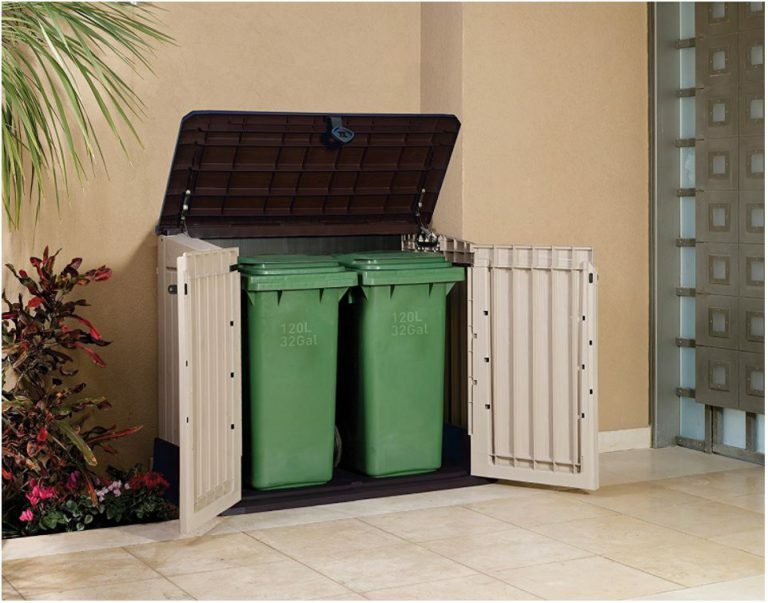 The Midi’s 845 Litre / 225 Gallon capacity is large enough to accommodate two 120 Litres / 32 Gallon wheelie trash bins whilst internally a dry & ventilated environment is maintained dispersing waste odours outside. 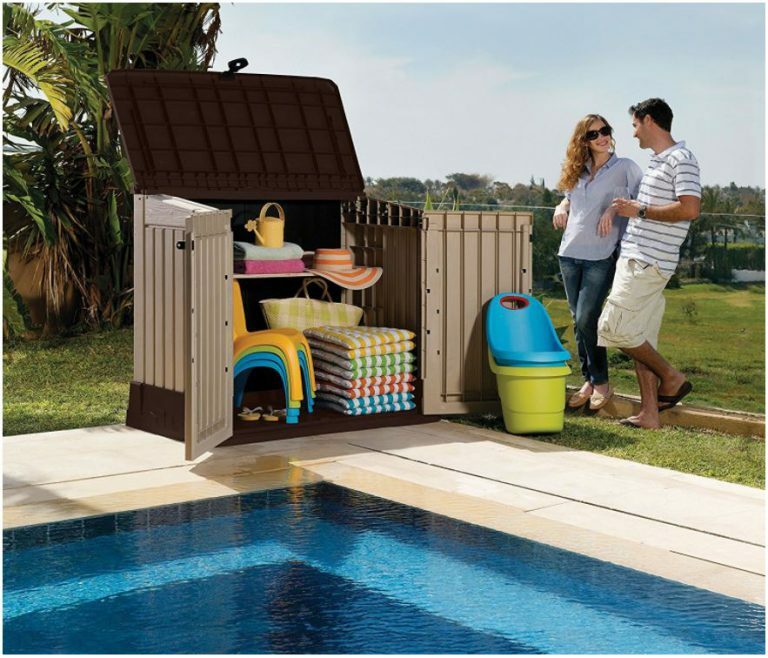 Alternatively if shelving is desired to organise gardening equipment, patio accessories or swimming gear etc, the Midi is constructed to accommodate. The inner ribbed sections within the facade’s side panels are designed to support one shelf by slotting into place within the resin ridges and secure with screws from outside the cabinet. The instructions provide detailed measurements for fitting your own wood shelf. 1″ thick plywood purchased at the local hardware store make ideal shelving for this purpose. 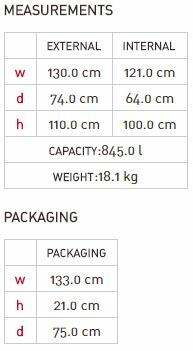 The Midi supports a shelving weight of 20 kg / 45 lb. The snap into place interlocking method designed for Keter’s Midi assembles the unit in approximately 25 minutes. This super-swift construction process requires assemblers to snap the facade panels into the base perimeter and secure with screws, even the lid clicks into position. Construction is complete in 9 steps. Household tools are the only necessities, just implement the demonstrated procedure illustrated in the instructions, voila-done! Midi’s only importance regards solid and level foundations where to locate. Level footings maintain a perpendicular stance ensuring the doors operate their correct swing whilst a sold base delivers the perfect substrate to prevent sinking and the floor to stand up to weighty storage stresses. Cheap and durable describes the Store-It-Out range. The Store-It-Out Max represents the most popular model due to the small increase in price delivering more accommodation. 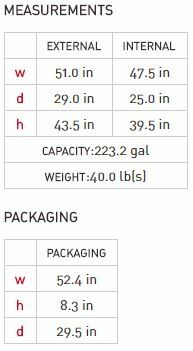 The Ultra is double the price of the max with larger dimensions. Keter’s Store-It-Out range are all global best sellers in their own right and receive fair reviews from those who accept this range is specifically designed affordable. Check out alternative low-profile sheds, more expensive yet more robust! 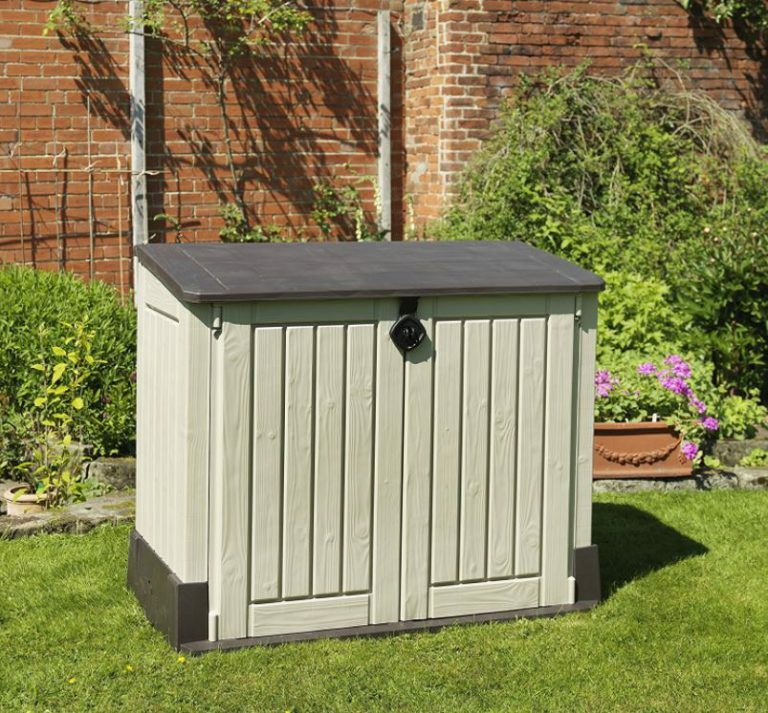 Keter’s Store-It-Out Midi delivers an affordable solution for outside storage, sits unobtrusively in a home-yard’s confined space, the low-profile design squats below the average house window and under the height of a common garden fence whilst delivering adequate internal storage capacity. 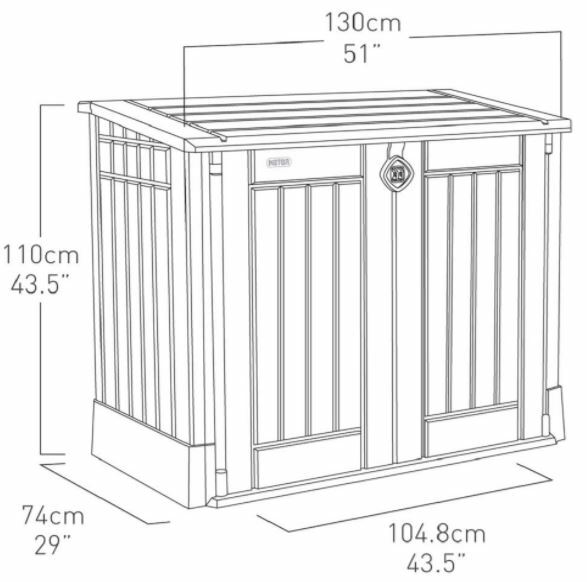 Enclosed in weather-resistant & durable polypropylene with a weatherproof design maintains a dry ventilated interior whilst the built-in floor keeps the inside dirt-free. 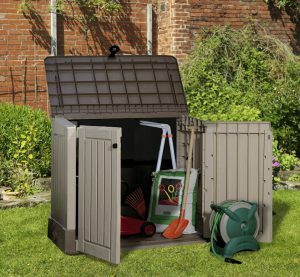 Super easy to clean with a 2 years Keter warranty delivers the affordable solution for outdoor storage accommodation however don’t expect a security safe. 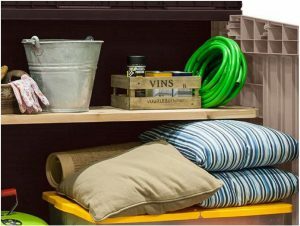 Thanks for reading about Keter’s cheap plastic garden storage solutions. 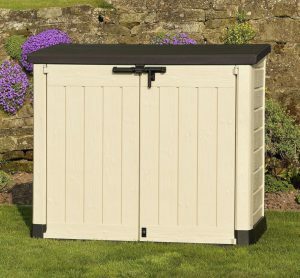 Any related mini shed queries, please share in the comment section below. Please share the Midi with your social friends. Thank you! 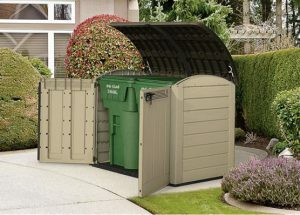 Keter is a great company for outdoor storage solutions. 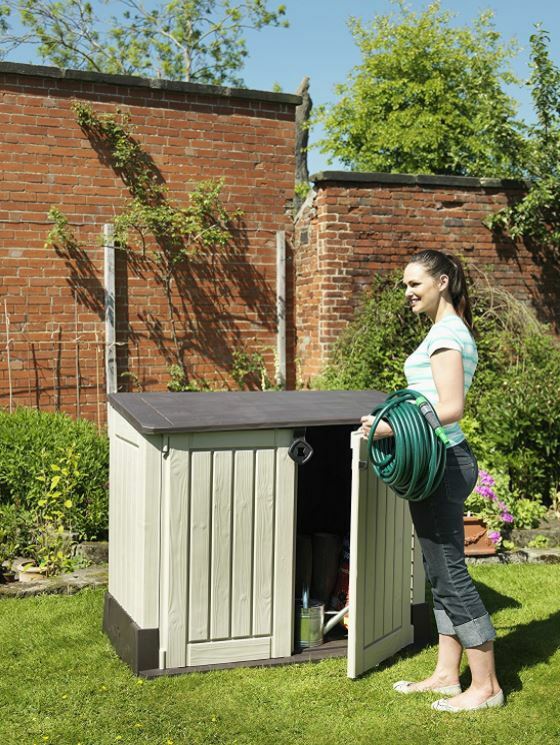 Having a small shed that opens up both in the front and top will allow easy access to anything inside. I like the shelve that is available also. I have a similar storage cabinet in my sun room. It does not have the opening top, it does have storage in the top. It does not look like you can sit anything on the top of this unit. Having the gas rods for keeping the lid open would be OK. Does the lid stay open if opened past straight up. Thanks for reading about Keter’s cheap plastic garden storage facility, the Store-it-Out Midi. 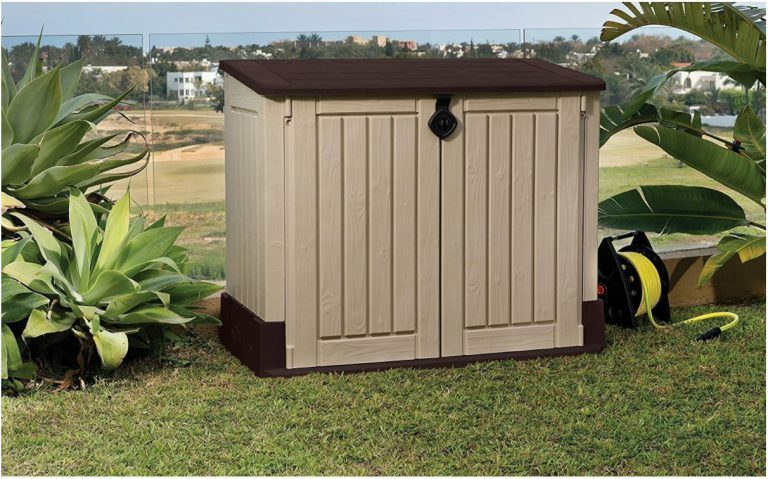 Keter do have worldwide sales with a variety of quality plastic sheds, their Factor Range of walk-in sheds and Store-It-Out range are of no exception. These are clearly down to being an affordable solution however if you wish for more sturdiness at the top of the resin manufactured market, the likes of their Grande-Store is breaking boundaries on new resin designs and molding techniques but this does demand one heck of an increase in price upon comparison. 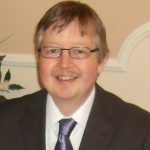 The shelf is an optional extra if you wish to incorporate your own, the precise measurements and how to fit are detailed in the instructions, it fits on top of a resin ridge (shelf support) and secures into place from outside the unit with screws. Yeah, the lid is at a slight angle, to generate fast drainage so standing things on top is not advised. Again due to the cheap price, hydraulic pistons are an optional extra. The Midi lid design goes slightly past 90 degrees to stay ajar. Most people stand the Midi against a house wall or fence to which the lid goes back against. The Store-It-Out Max is inclusive of hydraulic pistons with a larger storage capacity, a tad more expensive but seems to be the biggest seller out of the two due to these included features.